I am settling in nicely in my new home and had to pose for few pics before my new mom, Amy finds a final display spot for me in Amyville headquarters. I like my new home. 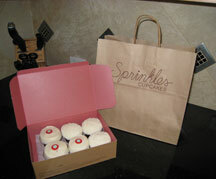 Amy made sure to have a little taste of LA-home waiting for me...Sprinkles cupcakes-- the new store opened in Scottsdale when Mr. Mark and Amy were in Hawaii. Amy stood in line 20 minutes for these cupcakes. I love cupcakes- especially the red velvet ones! Though I haven't seen the animals upclose (nor do I care too)- I peeked that this one (they call her coco chanel, I think) played in my fed ex box before Mr. Mark took it out to the recycling bin.- what savages. until next time this Mars...signing out! I took a quick break from normal-cy to have uber-fun with Myra's (of my little mochi fame) new Kokeshi Doll Tutorial Go Check it out at her shop!! It is the most well written step by step tutorial...and you get to play with paper and clay :) If you haven't checked out Myra's crafty-ness please sit back with some tea/coffee and look at her past creations on her blog, I am huge fan of all her creations-- especially the TEENY tiny crochet. 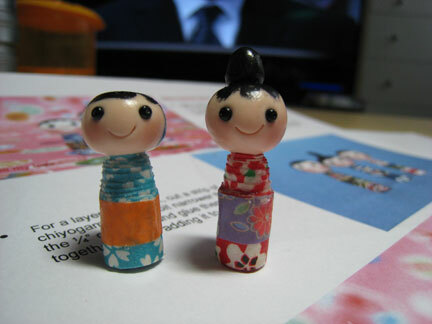 I made these two little cuties while watching a few episodes of my LOST season 3 dvd (yes I go back and REWATCH for more clues- and its on the big screen in the background) It is still my favorite show! Actually I work with her! Check out Shana in March's Cosmo Magazine! ShanaLogic is the only place amyville hangs her hat outside of the amyville town limits :) I have been working with Shana 3 years this month, and thanks to her I am able to send the amyville love to the edges of the universe! 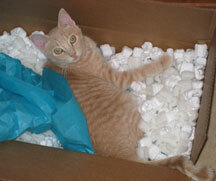 Thank you all for your heart felt emails and comments for Canella--- I love my blogging buddies! Check out Lauren's AWESOME Galaxy Girl line. I am a HUGE HUGE HUGE fan- and I am LOVING my Pluto shirt. 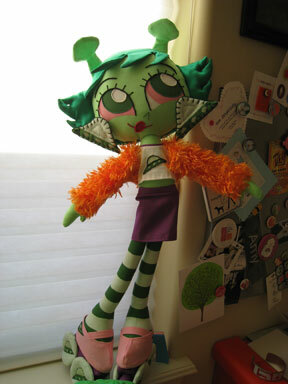 You may know some of Lauren's other work...she is a creator/writer/storyboarder/animator for Foster's Home for Imaginary Friends, and her husdband is Craig McCracken-- widely known creator of the Power Puff Girls (imagine the CREATIVITY in that household!) Lauren is an uber crafter, 80's loving pop culture girl after my own heart. 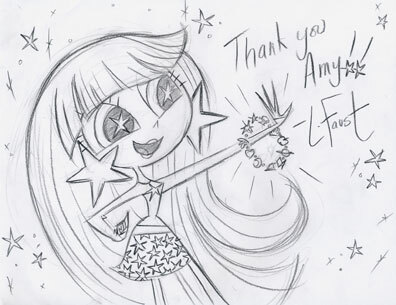 Check out what she sent me below (note its much larger, but scanned it in for effect!) 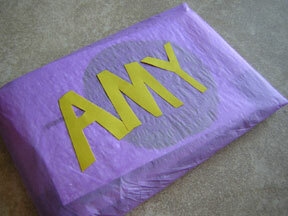 (and what I sent her) for some craftiness-goodness fix. See she is wearing the bracelet-- hehehe how cool is that! Aidan of Bubbledog fame has an abolutely awesome etsy shop-- go check it out! I ordered some goodies that arrived and knocked my socks off! I captured some pics-- the ones at his etsy shop are even better. Make sure to give him a shout out "hi" at his blog! 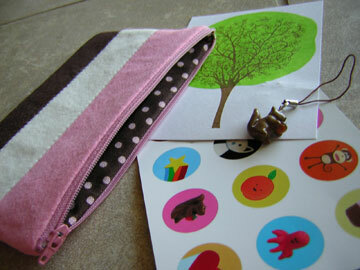 The neopolitan pouch is the best and the squirrel is to DIE for!!! And speaking of piddleloop moustaches...check out what Nat is up to as well! My friend Aidan has made his debut on Etsy! Go check out his great items. Aidan is a fellow 80s collector and we have been friends for years. 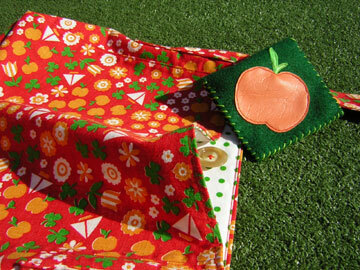 I ordered this awesome retro fabric bag from him -- it rocks! His sewing skills are incredible and he quilts too! He is an awesome designer. Three cheers for crafty dudes! and check out the detail of the fabric and the matching coin purse...so Paul Frank! Rack this up as another addiction pulling me away from the things I *should* be doing! The TEASE book is great! Oh and hey-- our Crafy Queen Mum Sarah of the small object fame has a project in there too! How cool is that?! I just picked up Mason-Dixon Knitting... Kay and Ann have put out some knitting gold here people. I have no time to post a picture, the book is calling my name, I can't put this book down! Who knew you could have fun with kitchen cotton yarn!!! Friday was Birthday time at the Luscious Gracious knitting studios. Look at the AWESOME cuff Kiki made for me! 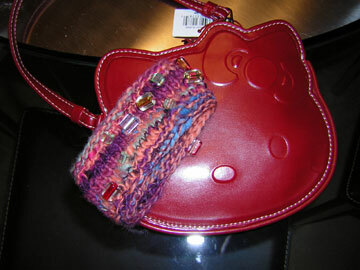 And who can resist a hello kitty wristlet? And a little craftiness as well-- to be found at your local Jo-Ann's Fabric....PEEPS! 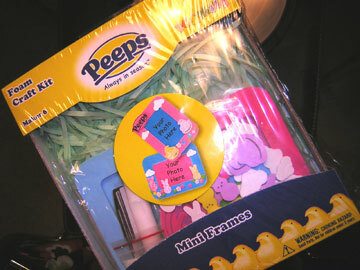 I picked up this Peeps frame kit (peeps made out of fun foam! )because it was just tooooo cute. Guess who will be making some peep frames???? ?